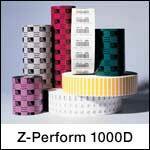 The Z-Perform 1000D is an uncoated direct thermal paper facestock that offers a low-cost solution for general-purpose industrial applications up to 3 inches per second. It is an excellent option for compliance, product, shelf and work-in-process labeling. The 1000D is recommended for short-term applications that do not require durability against moisture or tough environmental conditions including heat, humidity, or U.V. light. Compatible with Zebra RW Series mobile printers.